http://danvanhassel.com/wp-content/uploads/2016/11/Hysteriology-with-synths.mp3Recording of synthesized demo version. In 2009 Mike Straus approached me to write something for his “Ant’s Elbow” duo project with Griffin Campbell. 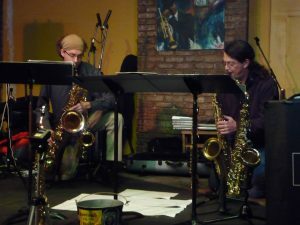 This project consisted of 25 new pieces of 100 seconds or less for two saxophones and fixed-media electronics that would all be performed continuously in a single concert. My interest in electronics in music has always been as an extension of live performance, the “instrument and tape” paradigm of using fixed backing tracks has never appealed to me. Because of the logistics of this concert, live electronics were out of the question, so I thought how should I approach using a fixed track? My primary association with backing tracks as a performer was the Jamey Aebersold play-a-long CDs popular for learning to play jazz. So I thought it would be fun to make my own zany version of an Aebersold play-a-long track to accompany the two saxophonists.